If you love hiking down with constant views, exploring the Quilotoa Lagoon is perfect for you. Some quick facts about Quilotoa: it’s an 850-ft deep, 2-mi long water-filled caldera and the most western volcano in the Ecuadorian Andes (3 hours south of Quito). It’s a beautiful spot and I do admit I loved the whole trip, but we were not fully prepared for the journey. Weather in Quilotoa is very unpredictable, it was cloudy at times and sunny at times. By the time we reached the lagoon, we took a kayak out in the water, and it started pouring rain. So I recommend being prepared with warm and waterproof clothing! (maybe even a change of clothes in the car). Unsurprisingly, there aren't ATMs up here. Therefore you need to budget and take enough money. We arrived at the Quilotoa National Park and begin our descent to the lake. After walking 3 minutes downhill, there it was, a stupendous view. The water is a turquoise blue and the clouds floating over it create darker shades of blue. With the steep crater walls surrounding the lagoon, the view is simply breathtaking. Realistically, the journey down took a little over an hour (group of 8 taking pictures all the way down). 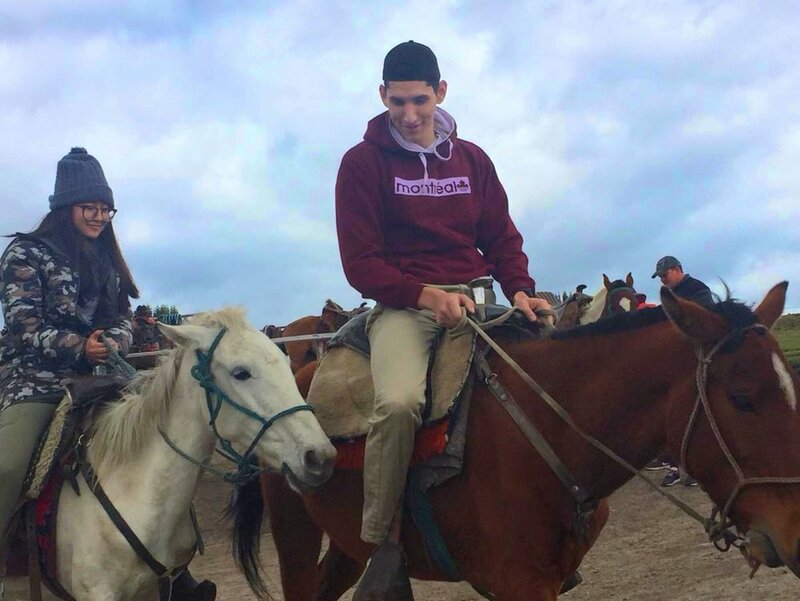 You can hike back up or rent a horse to take you, trust me, you’ll pay anything for a horse (it should be $10). Definitely visit Shalala after the hike, a community well known for their handicrafts. Grab some lunch and prepare for the 3 hour drive back to Quito. I’ll admit, I almost didn’t go on this trip… I was just really traumatized from getting rained on in Quilotoa. I’m not exactly a hard-core outdoorsy person (lol), but Tena and Misahualli were a wonderful adventure — I would’ve regretted not going! In the morning: The tour starts with a 3 hour drive from Quito to Tena. Once we arrived we got sized for rain boots, which are included in the tour (here) and necessary trust me. From there the tour continues to a river path where we hiked through the jungle - it’s muddy, slippery, awesome. What made it interesting was the stops along the way, there’s the Latas Bridge (the half-way point), and the tour guide points out various butterfly and insect species, ornamental plants, trees and palm species. Eventually we had to cross the river and hop scotch across some rocks. From there it was a quick 5 minute walk to the the Umbuni waterfall — in total it’s about an hour hike, but getting to the waterfall is worth it! Which to some of my cousins, plus my husband, meant celebrating by jumping in the water. In the afternoon: After the hike back (another hour) the tour took us to a small town Misahualli. We took a large kayak to a secluded little island where we were welcomed by the Shiripuno Tribe. They invited us to lunch, which is freshly cooked fish, yuca, and rice (it started raining - weather is so unpredictable). The highlight of that stop was being blessed with meeting a beautiful soul named Soledad (photographed in the Instagram post). Let me not ruin the whole story of their tribe, but basically 14 years ago, Soledad and a few other women of the tribe opened the doors to their village to teach others their traditions, history, and culture. Ended the tour by making some Ecuadorian cacao chocolate, drizzled it on some bananas. It’s a long, tiring, fun day — but don’t forget there’s still a 3 hour drive home. En las nubes de Baños. In a previous Ecuador trip, Abd-Allah and I took the bus from Quito to Baños, the town’s full name is Baños de Agua Santa: the holy water Baths. It's outside of Quito (beware there are some curvy roads). We took the bus early morning, there was unpredictable traffic so we were delayed getting to our destination. In reality the ride should only take around 3 to 4 hours. Baños has that backpacker feel — amazingly fun and walkable; here you can see waterfalls, hike through the forests, enjoy the steaming thermal baths (hence the town's name), bike or boat all the way to the Amazon Basin, and marvel at the occasional eruption of nearby Volcán Tungurahua. First thing we did was check into our hotel, this was unplanned, once we finally got to Baños we realized leaving the same day wasn't possible. So, we chose to stay at the Sangay Spa Hotel- the hotel has breathtaking view of the waterfall from the windows. Unlike the other adventure travel destinations, I highly suggest staying in Baños for an extra day or two, because there is so much to do there. We went to La Casa Del Arbol where you find a tree house with the "swing at the end of the world" at the top of a steep hill. It's a fun experience, not as scary as you might think. More than 60 waterfalls cascade into the surrounding countryside from the slopes of the volcano. The waterfall in front of our hotel is the Cascada de la Virgen but there is also Pailón del Diablo waterfall, the park for it is $1.50 to enter. To get here we will have a hike along a forest path for around 45 minutes. So the TeleferiQo is not exactly a crazy-hiking-adventure (unless you choose to hike up the volcano) but it’s still fun. The ride up is scenic, you get to see most of Quito from above. 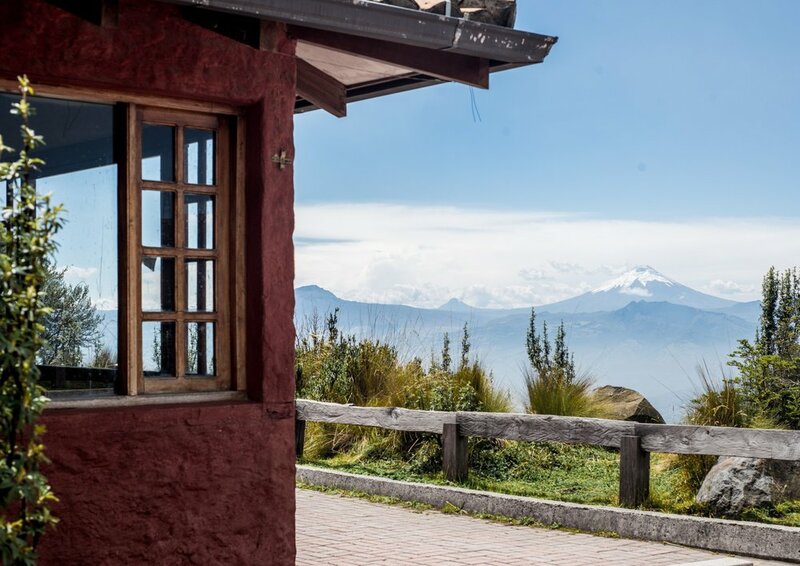 In Quito, you start at 9,350 ft. The TeleferiQo ($8.50) brings you up further still to 12,943 ft and the summit Rucu Pichincha is at a [literally] breathtaking 15,413 ft. You can get winded just tying your shoes in Quito, so climbing a volcano is nothing short of exhausting. But for views of the sprawling city and the neighboring Cotopaxi volcano, the TeleferiQo is the way to go and if you’re up for it Rucu Pichincha is definitely worth the climb. Photo ops: A few minutes up the path of Pichincha you can stop to take pictures with some adorable llamas (0.50/person). If you continue up the path, there is a swing overlooking the city (free). The higher you hike, the harder it is to breathe, but if you want to ride some horses just continue up the path!